Hagi Yaki is ceramic made in the city of Hagi in Yamaguchi Prefecture. It is popular among tea ceremony practitioners to the extent that it is said that its cups are among the top two varieties. The most prized qualities of Hagi Yaki are its softness, causing limited contraction when fired, and its high water absorbency. Because of this property, after long years of use the tea or alcohol it has held stains it and its color changes. This change is enjoyed and referred to as "The Seven Changes of Hagi" by tea ceremony enthusiasts. Another feature is the simplicity of its shapes and ornamentation. Most pieces feature no designs. Aside from the yellowish and soft cream colors, the patterns called "Gohonte" and "Kairagi" are also particular to Hagi Yaki. 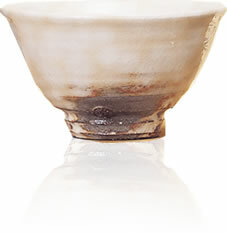 Gohonte takes the pinholes that were originally considered imperfections in the glaze and makes a feature of them, and Kairagi makes use of "faults" such as contractions and cracks in the glaze. Tea ceremony practitioners saw the implicit beauty in the unevenness, and as a result this aspect of craft and culture developed. In the world of tea ceremony, Hagi Yaki tea cups are highly regarded and said to be in the top two varieties. There are a variety of reasons for this, such as their suitability for tea and feel when held, but perhaps the biggest reason is the way they are affected by the tea. The material used for Hagi Yaki is rough and does not fire hard. 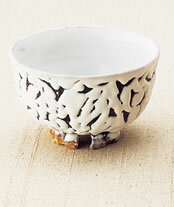 After years of use, an originally pure and bright Hagi Yaki teacup changes in color to a calm, cool color. 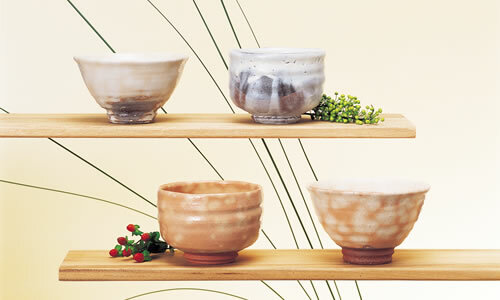 The beautiful way in which Hagi Yaki ages is called "The Seven Changes of Hagi" by ceramics enthusiasts. The rough material used for Hagi Yaki teacups is one of their attractions, but because of their permeability fine cracks open in the glaze so tea and other liquids more easily work their way inside. After long years of use, the tea permeation causes the surface color to change to a deeper color and the cracks to further stand out, resulting in a pattern with true character. The way the color stains the piece will change significantly depending on how it is handled. If used for a long time and cared for carefully, Hagi Yaki will go through not just seven but an infinite number of changes. You will be able to enjoy having a unique item that you have played a part in creating. In general, Hagi Yaki is not loudly decorated, and the simplicity of its materials and glazes are one of its strong points. When used as a vase, it puts the beauty of the flowers on display without dominating itself, and when used as tableware it emphasizes the beauty of the cooking. 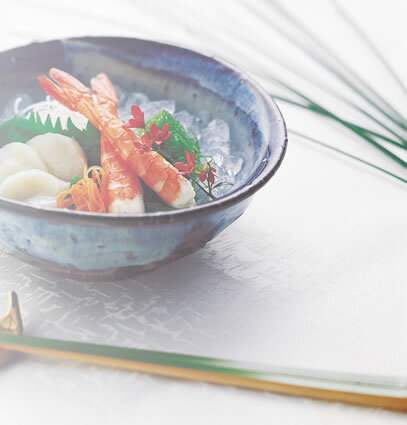 The softness of Hagi Yaki means that it not only looks pleasant, but also feels that way too. And its low conductivity means it maintains the heat of foods and drinks such as hot tea, without itself becoming too hot. the colors that change the more it is used. The appearance is plain, but this is ceramic with passionate followers. Vases that don't upstage their flowers they display. Perfect for cold sake; cups for a special occasion. 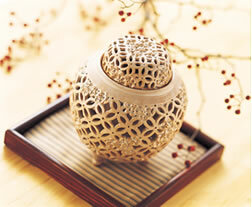 Incense burners that also add to your home's design. Green tea cups long-loved by the tea ceremony world. Cute little cups you'll find yourself wanting to collect. To explore the origins of Hagi Yaki, we must look back to 1604, when Toyotomi Hideyoshi and Mouri Terumoto returned from the Korean peninsula with potters Rishakkou (bound to the Yamamura household) and Rikei (bound to the Saka household). 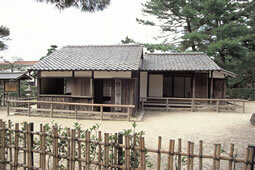 It is believed that Hagi Yaki's beginning was the brothers' construction of a kiln near Mouri's castle by his orders. 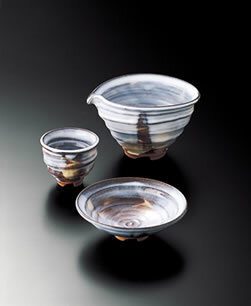 The original style of Hagi Yaki was similar to that of Korean cups, with the same techniques and shapes used. Over time, the style changed, and unique Hagi Yaki like that of today came to be made. Ceramic made up to and during the life of the third generation of Sakas is called "Old Hagi," and this was the golden age of Hagi Yaki. 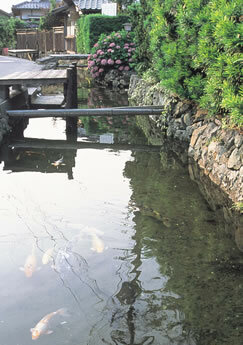 In January 2002 Hagi Yaki was declared a Ministry of Economy, Trade and Industry Designated Traditional Craftwork. 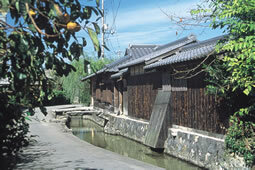 Clay is created using earths from near Hagi, such as Daidou, Mitake and Mishima. It is worked using techniques such as working on a potter's wheel, bending with the hands, pressing and using foot bellows, then decorated or carved. After firing, it is glazed. 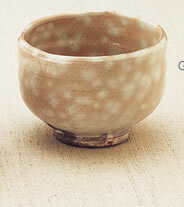 The glaze may be transparent or white, and after application it is again fired in a "nobori kiln." The parts of the glaze touched by the fire of the kiln change in appearance. 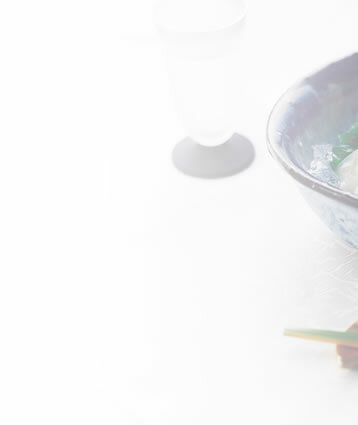 Each time you use Hagi Yaki, first soak it in water to allow it to absorb plenty of liquid. This well prevent the smell of soup or oil penetrating the ceramic, and cause the color to develop more brightly. If using for tea, it will prevent a sudden change in color from occurring as a result of tea absorption. ●Before using for the first time, soak overnight in water to remove fragments and the smell of the packing material. ●The base of a cup is not usually glazed, so it may mark surfaces it is placed on. If you are concerned, we recommend rubbing with sandpaper or a grindstone to make it smooth. ●When you start to use it, ceramic may leak, but continuing to use it will naturally develop a seal as a result of the penetration and encrustation of tea. If leaking continues, dry the item well, fill it with rice gruel or cornstarch and leave it to soak for 6 hours. ●Strongly acid, oily or alcoholic food and drink can cause stains, odors and stickiness, so avoid leaving the ceramic for long periods while it contains these. ●Do not put in a microwave. The color of the glaze may change and it may crack. ●Because this is soft ceramic, it must be handled with care to avoid breakage. Do not store with hard porcelain. ●After washing, dry well before putting away. ●Kannyuu: the cracked nature of the surface glaze. ●Gohon: teacups made around Pusan from the Momoyama era to the Edo era (1573-1867) using the "Gohonte" technique Japan taught to Korea. Reddish spots often appear on these teacups as a result of the composition of the earth, and these marks are also called "Gohon." ●Koudai: the round ring at the base of a teacup. They can be created separately and attached ("attached koudai") or worked from the body of the teacup with a spatula ("pared koudai"). A koudai with a nick taken out of it is called a "cut koudai" or "broken koudai." In Hagi Yaki, "broken koudai" are common and form one of their notable features. 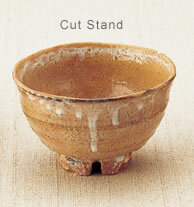 ●Cut Koudai: there are a variety of theories as to the purpose of the cut-stand. It is speculated that, regular sale of ceramics made at the Mouri kiln being prohibited, the bases were intentionally cut so the piece could be sold as a reject. Another idea is the, following the tradition from the Korean Joseon era, rope was threaded through the cuts in the bases to make the cups easier to carry in bulk for sale at market. ●Youhen: the change in color of the glaze where it has been touched by fire in the kiln. 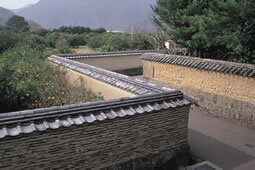 ●Nobori Kiln: a kiln containing 3-20 firing chambers, built on a sloping base. Because kindling is burnt from the bottom part, it can be warmed up. When firing, the temperature inside the kiln is a high 1000-1500 degrees Celsius. In Hagi, red pine stripped of its bark and dried for over six months is used for fuel. ●Daidou Earth: the most well-known earth used for Hagi Yaki. It contains the plasticity of sand and pebbles, is resistant to heat, and a blue-white color. ●Mitake Earth: taken from the east of Hagi, it is a rough material yellow-white in color. It is not sticky, but it is very resistant to heat. The main materials used for Hagi Yaki are Daidou and Mitake earths, and the value of the piece varies depending on their ratio. 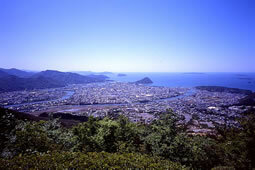 ●A black, volcanic earth with low heat resistance, taken from Mishima Island near Hagi. It is mixed in small quantities with Daidou and Mitake earths.